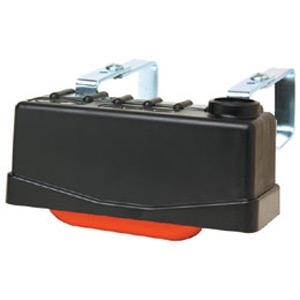 Little Giant Trough-O-Matic Float Valves automatically control the water level for most plastic and metal stock tanks, troughs, barrels, and pans. The all-plastic valve flows up to 245 gallons per hour and operates at pressure between 20 and 50 psi. The popular rugged plastic housing is molded from high-grade polystyrene for added strength and durability. Comes with expansion brackets to fit tanks rims up to 2 inch thick and 4.325 inch wide. Accepts a standard 3/4 inch garden hose. Measures 7.5 inch long by 3 inch wide by 3.5 inch high.